451 pages | 265 B/W Illus. Numerous books have been written about Toyota's approach to workplace improvement; however, most describe Toyota's practices as case studies or stories. Designed to aid in the implementation of Lean manufacturing, The Modern Theory of the Toyota Production System: A Systems Inquiry of the World’s Most Emulated and Profitable Management System explains that your organization already has what it takes to succeed with TPS and what’s probably missing is balance. 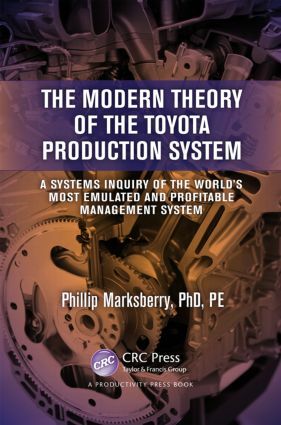 Bridging the gap between implementation and theory, this text is the first of its kind to use systems theory to study how the pieces of the Toyota Production System (TPS) work together to achieve this much needed balance. Lean practitioners will learn how to use system theory to improve overall decision making when applying Lean or Toyota-like management systems. Explaining that the glue that holds the pieces of TPS together is just as important as the pieces themselves, the book provides you with invaluable guidance in the implementation of Lean manufacturing from a management perspective. Itoutlines a blueprint to help you develop a clear understanding of how the pieces of TPS need to come together so you can achieve something greater than what’s possible with the individual pieces. Dr. Marksberry looks at TPS in the context of organizational behavior, social sciences, management science, and engineering sciences. He presents new insights into how the elements of TPS work together as a system across an organization. Both scholars and practitioners of TPS and Lean Manufacturing will find this book to be thought provoking and revealing about how successful TPS operates. Why Systems Theory for the Toyota Production System? What Type of Industrial Engineering Identity Is TPS? Standardization or Kaizen (Business Process Reengineering)? Knowledge by Observation (Genchi Genbutsu) or by Inference (Data)? Scientific Method or System Optimization? What If Leadership Is Not on Board with Defining, Coaching, or Implementing Lean? How Do You Know When the Modern Theory of TPS Is Working? Dr. Phillip Marksberry is the vice president of engineering and quality for American LaFrance, a custom manufacturer of emergency vehicles and modern fire engines. He received his BS in mechanical engineering at the University of Kentucky in 1997 and became board certified as a professional engineer in 2001. In 2000, he received his master’s degree in business management at Brescia University and in 2004 his PhD in mechanical engineering at the University of Kentucky. Dr. Marksberry has more than 20 years experience working in the automotive industry and holds several patents in metal cutting and product design. He has also held roles in production engineering, product design, industrial engineering, and operations. Prior to American LaFrance, he was a faculty member of the College of Engineering, with a joint appointment in the Department of Mechanical Engineering and Center for Manufacturing. Dr. Marksberry has published over 30 technical journal articles and has been a member of various technical societies.